The very best designer dog collars, luxury cat collars, fancy harnesses, carriers, clothes and accessories for your very best friend ~ small and large. - with U.S. shipping up to $4.99 and over $99.00 ships FREE! A gator embossed pink leather dog collar with Swarovski crystals. For small to large dogs. Your little dog will be traveling in style in this luxurious designer dog purse. Stainless steel dog tags with Swarovski Zirconia. Engravable. 3 sizes. Leather dog collars featuring unique flower conchos for small to large dogs. Adorable dog pajamas with a cute dinosaur print. 100% cotton. A studded leather dog collar great for biker dogs. A black Italian full grain leather dog collar with genuine black onyx gemstones. A plush velvet sling-style dog carrier with leather straps and pocket flaps. A tutu dog dress with your pet's name in rhinestone "bling". For small to large dogs. Alpaca wool turtleneck dog sweaters in blue and salmon pink. Bringing you the finest designers, hand selected for quality and workmanship. Here you will find unique pet items as well as everyday necessities to keep your pet healthy and active. 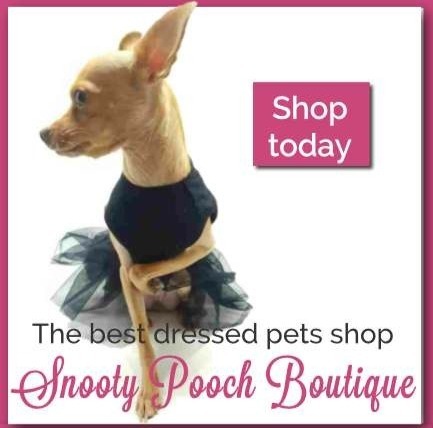 Snooty Pooch Boutique carries collars for cats and small to extra large dogs in fine leathers, Swarovski® Crystal or create your own unique pet collar with our wide variety of custom collars for all pet sizes with matching leashes. Shop harnesses for small, large and extra large dogs in many great styles. Choose from fine leather, with Swarovski Crystal or create your own unique harness with our wide variety of custom harnesses. A variety of harnesses for the cute small dogs as well as the tough bully breeds. We value you and your furry best friends and want to provide you with a truly exceptional shopping experience. If you have any questions or need assistance, please call or email us. Your feedback is very important to us. ... I purchased for my blue heeler! I measured her neck as suggested you do, The fit was perfect!! Western and classy all in one collar! No buyers remorse! Well worth the money and not a collar everyone else has! I ordered a beautiful collar for my precious Yorkie. The communication from your company was excellent. I received the collar exactly when I was told to expect it. It fits perfectly and looks just great in her. I highly recommend this company. A real pleasure to do business with.